The Space Studies Institute was formed in 1977 to provide a private, non-governmental source of support for research and education. Institute support enables that work to be conducted efficiently on the basis of a logical long-term plan. To state the High Frontier concept succinctly, it is to open for human benefit the energy and material resources now going unused in space. The research supported by the Institute is directed toward the use of lunar and asteroidal materials to build–in high orbit-­useful products. In the early period of High Frontier activity those products may be satellite solar power stations, to receive and relay to the Earth (as low-density microwaves) solar energy intercepted beyond the shadow of the Earth, where intense sunlight is available full-time. In this early phase, the main benefits will accrue from a saving in lift costs. The cost in energy of bringing material from the Moon into free space for construction is less than a twentieth as much as for bringing material from the Earth. Ultimately, the energy-rich environment of high-orbital space, where abundant materials can be obtained without environmental damage, will become the favored location for large-scale human habitation. As described in my book, The High Frontier, a habitat constructed in space can contain an atmosphere, can rotate \o provide a gravity equivalent to the Earth’s, and can be supplied with normal sunlight through mirrors. The known materials of the asteroid belt are sufficient for the construction of space habitats with a total land area several thousand times that of the Earth. Their internal environments can be as Earthlike as desire and ingenuity permit, and each habitat can be several square miles in extent. In the long run we can expect a gradual movement of much of human civilization into space, where a high-level industrialized society can survive as long as the sun shines. It is essential to the High Frontier concept that it requires no science beyond our present knowledge, and no engineering of a more advanced nature than we now employ routinely. The imperatives that will bring about its realization are eternal facts of nature, concerning quantities and locations of materials and the abundance of clean, free solar energy available everywhere outside the shadow of planets. l. The High Frontier(G.K. O’Neill, William Morrow edition, 1977; Bantam paperback edition, 1978. Also published in German, French, Japanese, Spanish, Italian, Dutch, Swedish and Danish). 2. “Interview: Gerard K. O’Neill,” by Monte Davis, Omni Magazine, July 1979. 1. “Colonization of Space,” by G.K. O’Neill, Physics Today 9/74, pp. 32-40. 2. 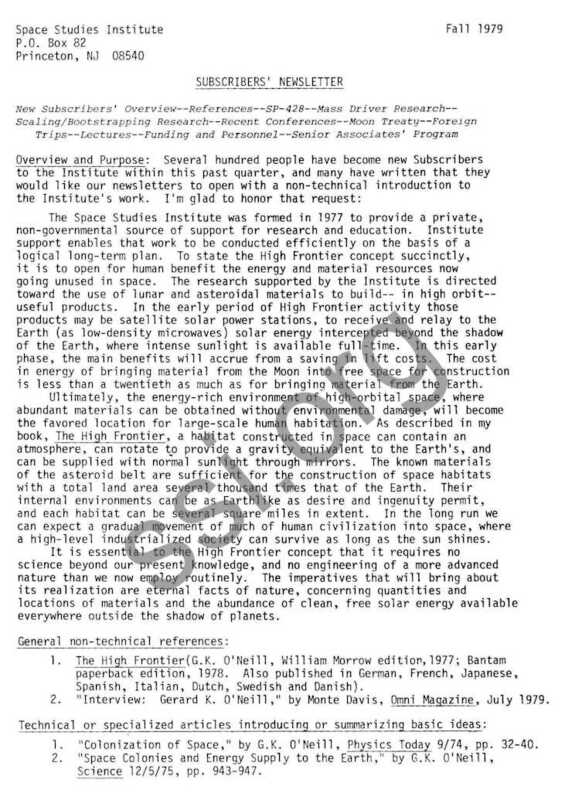 Space Colonies and Energy Supply to the Earth,” by G.K. O’Neill, Science 12/5/75, pp. 943-947. 3. “Asteroid Mining,” by B. O’Leary, Astronomy ll/78, pp. 6-15. 4. “Low Profile Road to Space Manufacturing,” by G.K. O’Neill, Astronautics and Aeronautics 3/78. 5. 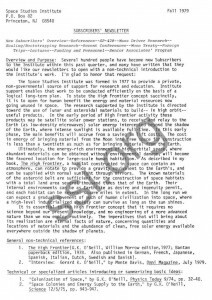 “Space Manufacturing, Satellite Power and Human Exploration,” by Brian O’Leary and G.K. O’Neill, Interdiscinplinary Science Reviews, vol. 4, no. 3, 1979. 1. Space-Based Manufacturing from Non-Terrestrial Materials, Vol. 57 in Progress in Aeronautics and Astronautics Series, AIAA 1290 Avenue of the Americas , New York, NY 10019). 2. Space Manufacturing and Space Settlements, NASA SP-428 (1979; Super­intendent of Documents, U.S. Government Printing Office, Washington, D.C. 20402); $6.50 (Document stock #033-000-00765-5). In September, the long-awaited NASA Special Publication 428 (SP-428) was published by the Government Printing Office. It contains 17 signed, peer ­reviewed technical articles from the 1977 NASA-Ames Study on Space Manufacturing and Space Settlements. That study, carried out under my direction, was the largest on those topics ever held. The mass-driver is a special type of electric motor, designed to accelerate materials to high speed through the application of controlled pulsed magnetic fields to a carrier “bucket.” Research on mass ­drivers is supported by the NASA Division of Propulsion and Power, with strong assists from SSI. In the past quarter most of the control and monitoring circuitry for a 2.5 meter accelerator/decelerator has been built. A pulsed magnetic driver to inject the bucket into the main accelerator with the correct initial velocity also has been assembled and tested. A short section of the main accelerator was pulsed at reduced power with the bucket moving through it: an acceleration of over 100 gravities was measured, in agreement with calculations. With SSI support, a workshop was held in August 1979 to study near-term, low-cost approaches to the establishment of space manufacturing. This could be accomplished through maximum use of available levels of industrial automation, of hardware being developed for the Space Shuttle era, and of small-scale initial manufacturing capable of reproducing many of its own components. In a typical scenario of that kind, a small mass-driver is lifted to low Earth orbit by the Shuttle, is then brought to lunar orbit and soft-landed on the Moon by chemical rockets, and begins operation to project lunar material to a reception point in space. The mass-driver is normally unattended, its operation being controlled from the Earth through a radio/video link. (In current industrial jargon this is called “telefactoring.”) The lunar installation is revisited occasionally for maintenance and repair. In space, a small processing facility separates the collected lunar soil for its oxygen, which much reduces all subsequent requirements for rocket propellant. A small general-purpose processing facility and machine shop, human-attended, is then brought to high orbit. It produces replicas of the heavier, less complex components for additional mass-drivers, chemical process plants, and machine shops like itself. With minimal input from the Earth, the limited industrial facility placed initially in space then grows geometrically, reaching within a relatively short time (2-5 years) a level of industrial output great enough to produce 100,000 tons per year of products, for example, satellite power stations. The workshop calculations indicate a total investment roughly equal to the Space Shuttle development cost ($8 billion) to reach a return level of about $10 billion per year. Papers on mass-drivers (Princeton/M.I.T. ), on chemical processing (Lunar and Planetary Institute), and on fabrication methods in space were presented at the Advanced Systems Session of the 1979 International Astronautical Federation Meeting in Munich (9/79). The 14th International Electric Propulsion Conference was held in Princeton Oct.30-Nov.l. Papers on mass drivers were presented by H.H. Kolm, W. Snow and myself. Preprints from both these conferences are available from AIAA (1290 Avenue of the Americas, New York, NY 10019). This summer the United Nations Committee on the Peaceful Uses of Outer Space completed deliberations on the proposed Moon Treaty (Agreement Governing the Activities of States on the Moon and Other Celestial Bodies). The Treaty was sent to the General Assembly where approval is expected in the current session. By the end of the year, the Treaty probably will be open for signatures of the individual nations. If signed by the U.S., the required ratification by the Senate could extend the process a year or more. Central to the debate on the Moon Treaty is the question of its potential impact on the actual “breakout” into space. Will the Treaty help that happen sooner, or will it be an obstacle to near-term space utilization? Strong arguments on both sides of that question have been presented to SS!, and the Institute is assembling information on the subject for a systematic review. lecture at the Karl Renner Institute in Vienna in late January. The govern­ment of Japan is continuing negotiations for a trip it has requested I make to that country, and the last week of March 1980 has been agreed on for the visit . With this termination of NASA funding, Dr. Brian O’Leary, who has worked on this project since 1976, has transferred to the status of SSI Consultant for the period Oct. 1979-Jan. 1980, and after that time will write, lecture and consult on a freelance basis. We expect to continue in cooperation, and SSI will be glad to forward requests for Dr. O’Leary’s lectures and articles. Laura Hagopian Button’s position as Research Assistant, half-time on mass­ driver research and half-time on systems design, is unaffected by the changes in funding, thanks to greatly augmented support for SSI received during the last quarter. SSI will be able to support the systems-design work and also the thesis research of Scott Dunbar into the orbital mechanics of the Earth-Sun LaGrange points. Because of SSI, therefore, the basic thrust of space manufacturing will continue, though at a slower pace. Our highest-priority unfunded research is still in the area of chemical processing (element-separation) of lunar materials. There is a strong possibility, given the observed rapid growth pattern both in the number of SSI Subscribers and in the total pledges of Senior Associates, that within the next year SSI may be able to commence supporting that research. That is our main goal, and we welcome your support in achieving it. All of us at SSI thank the many of you who became Senior Associates or who brought in new Subscribers. answer our July questionnaire. a remarkable rate of return. We have also thank you for taking the time to answer our July questionnaire. Over half of all Subscribers have responded -­ a remarkable rate of return.